Over the past few decades, the consistent rally of fluctuations in global crude oil prices may have sent the overall monoethylene glycol industry into a tizzy. However, the gradual stabilization of crude prices in the recent times is anticipated to boost the financial dynamics of this business space and reinvigorate the fading optimism of monoethylene glycol manufacturers in the forthcoming years. 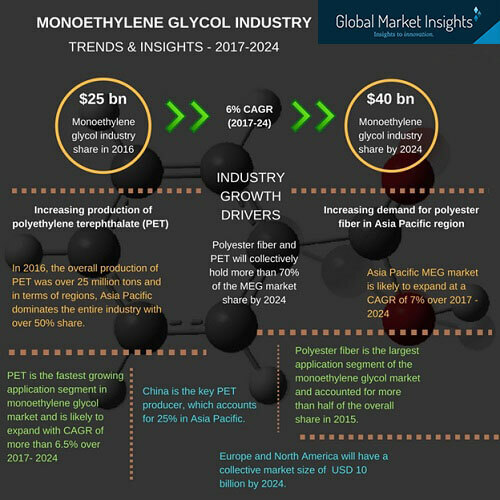 In fact, authentic estimates indicate that the global monoethylene glycol market share is likely to register an impressive y-o-y growth rate of over 6 percent over 2017-2024. Apparently, the ever-evolving fashion trends complemented with drastic alterations in consumer lifestyle has brought about a paradigm shift in the way modern-age apparels are designed. This phenomenon has, in turn, driven the production and sales of polyester fiber which is known for its exceptional chemical and mechanical properties. Here, it would be prudent to mention that monoethylene glycol is being extensively utilized as a primary raw material for manufacturing polyester fibers. In consequence, the rising prominence of polyester fiber across several end-user verticals, including the likes of electronics, textiles, packaging, and resins, would undeniably provide a substantial impetus to the swift progression of the overall monoethylene glycol industry share in the forthcoming years. One of the most pivotal factors to have reenergized the fraternity of MEG manufacturers is the noteworthy amendments that are being made in monoethylene glycol production technology. This presumption is amply validated by a recently forged collaboration which aims to transform the growth matrix of the monoethylene glycol industry. Regarded as one of the most acclaimed thermoplastic resins and MEG manufacturers of the U.S., Braskem America, Inc has recently unveiled its ambitious endeavor to produce monoethylene glycol from sugar. As per reliable reports, the firm has apparently inked a technological MoU with an eminent Denmark-headquartered catalysis company Haldor Topsoe. The agreement aims to build a demonstration industrial unit in Denmark, which would focus on a two-step process to convert sugar into monoethylene glycol. Industry experts have increasingly termed this latest technique as novel and remarkable with the potential to alter the conventional monoethylene glycol production technology, something which would eventually propel the monoethylene glycol market share augmentation over the upcoming years. Elaborating further, the latest cutting-edge technique has been reported to be a bio-based monoethylene glycol production technology. This is a yet another major contribution, after the introduction of Green polyethylene, toward realizing a more sustainable future as this technology would be utilized to deploy renewable polymers and chemicals in carbon capture mechanisms. Moreover, this pioneering monoethylene glycol production technology is expected to lower the initial investments of the project and restore the cost-effectiveness of the whole manufacturing process. Needless to mention, the operationalization of such innovative production techniques would bolster the growth prospects of the global monoethylene glycol industry in the ensuing years. In fact, as per a recently compiled research report of Global Market Insights, Inc, the monoethylene glycol market is estimated to have commanded a total valuation of over USD 25 billion in 2016, statistics that affirm the efficacy of the aforementioned declarations. Holding a commendable position of authority in the overall monoethylene glycol market, the United States is likely to retain its standing as one of the most profitable growth contenders of this business space. Apparently, it would be prudent to take note of the fact that the monoethylene glycol manufacturers in the US had suffered a major setback on the supply front in the aftermath of Hurricane Harvey in 2017. In consequence, the US monoethylene glycol industry share had demonstrated a rather sluggish growth owing to the impact of the disaster. However, the recent upsurge in domestic demand from the downstream polyethylene terephthalate (PET) sector has sent waves of anticipation across the community of monoethylene glycol manufacturers. This renewed enthusiasm being observed in the monoethylene glycol industry can be put into perspective by citing the instance of ExxonMobil Corporation. Touted as one of the most dominant monoethylene glycol manufacturers of the US, the company has rolled out a massive blueprint to construct the world’s largest ethylene cracker facility at San Patricio County, Texas. Apparently, it is being said that the latest facility would produce a staggering 1.8 million tons of monoethylene glycol and polyethylene, something which can be aptly termed as humongous. It is quite evident from such incidences that the monoethylene glycol market trends in the United States would be driven by sizable investments by MEG manufacturers and, in all likelihood, this business sphere would observe revolutionary altercation of sorts in the immediate future. Considering the aforementioned aspects, the United States would undoubtedly continue to retain an enormous portion of the global monoethylene glycol industry, given that the country, as of now, boasts the robust presence of some of the foremost MEG manufacturers in the world along the likes of MEGlobal, LyondellBasell, Nan Ya Plastics Corporation, Eastman Chemical, Shell Chemical, and Huntsman among others. Over the past few years, the monoethylene glycol industry in India has witnessed dramatic upturn of events with leading players of this business space setting exceptional production records and global standards. Citing an instance to validate the same, Reliance Industries Ltd has recently concluded its multi-billion-dollar expansion plan by operationalizing the world's largest off-gas cracker facility at its Jamnagar oil refinery complex. Reportedly, the latest expansion move would assist the monoethylene glycol market giant to raise the existing production capacity of ethylene by two-fold and would further place the firm in the league of the topmost petrochemical producers globally in the ensuing years. The commissioning of the facility has accentuated the firm's manufacturing capacity of ethylene, used in downstream plants to produce monoethylene glycol, to a staggering four million metric tons per annum. Apart from major private entities, public sector undertakings of the nation have set their sights on expanding their production facilities to meet the growing demand for monoethylene glycol. Indian Oil Corporation Ltd (IOCL) for instance, has recently announced to invest close to Rs. 52,000 crores in expanding its oil refinery at Paradip, Orissa. Regarded as one of the most prominent state-owned company, IOCL plans to build a new petrochemical complex that is likely to ramp up the manufacturing capacity of the refinery by 5 million tons per year – a move that would aid the firm to set up a full-fledged MEG production plant over the next few years. Consequentially, it is quite obvious from the aforementioned incidences that the monoethylene glycol market size is slated to witness a significant boost in India. Historically, constant fluctuations in crude oil prices have continually affected the growth trajectory of monoethylene glycol market trends which is intricately linked with Oil & Gas industry. Say, for instance, MEG prices surged to USD 1,000 per metric ton mark in the Asia Pacific region in the first week of January 2018, given that the market was rife with bullish sentiment as the crude oil prices observed a steep hike. Apparently, an ambiguity of sorts is observed across raw material manufacturers as the prices of crude oil observe periodic fluctuations, thereby influencing the monoethylene glycol market outlook. However, it is quite prudent to mention that the robust requirement for this compound across a plethora of end-use verticals is likely to catapult monoethylene glycol industry size to greater heights over the estimated timeframe. In fact, the global monoethylene glycol market size is bound to exceed a total remuneration portfolio of USD 40 billion by 2024, as per reliable estimates.